The Quaternary is conventionally subdivided into glacials and inter glacials, with further subdivision into stadials (shorter cold periods within interstadial or interglacial stages) and interstadials (shorter mild episodes within a glacial phase). Glacial stages are normally considered as cold phases of major expansion of glaciers and ice sheets. Interglacials are considered as warm periods when temperatures were at least as high as during the present Holocene interglacial. These terms, however, lack precision and are difficult to apply. Still, they are widely used among Quaternary scientists. A subdivision into a coherent scheme of glacial and interglacial stages for the stratigraphic record from the land areas of the northern hemisphere has been extremely difficult. Therefore a system based on the deep ocean oxygen isotope record has come into use. The marine isotope signal is mainly controlled by the global volume of terrestrial ice, and fluctuations in the isotopic signal can be looked upon as a record of glacial and interglacial fluctuations. A system of isotope stages has therefore been developed. Counting from the most recent, each isotope stage has been given a number, even numbers reflecting stadial glacial/cold stages, while odd numbers denote interstadial interglacial/warm phases. 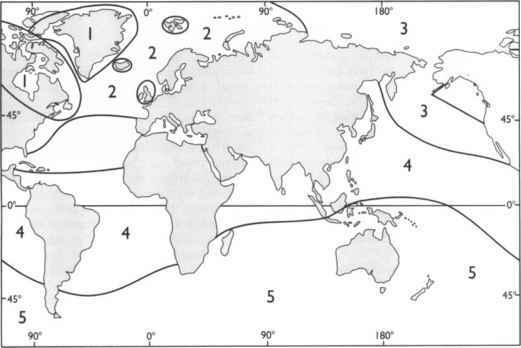 The deep sea oxygen record is global and therefore geographically consistent. During the last 800,000 years there have been about ten interglacial and ten glacial stages, while during the past 2.5 million years the total number of isotope stages exceeds 100, corresponding to between 30 and 50 glacial/ interglacial cycles (Ruddiman et al, 1989; Ruddiman and Kutzbach, 1990) (Fig. 5.2). Palaeoclimatic records from the deep sea floor show that during the last 3 million years more than a hundred global mild and cool oscillations took place with a larger amplitude than those recorded during the Holocene. Variations of dry and wet climates in the Chinese Loess Plateau and in the loess belt of central Europe have a similar frequency (Kukla, 1987). The periodicity of past major climate variations agrees well with the orbital perturbations. The amplitude of the orbital cycles and of the marine oxygen isotope variations is relatively uniform. However, several of the cold climate episodes recorded on land seem more severe than others (Chinese loess units LI, L2, L5, L6 and L9; central European loess cycles B, C, F, H and J; corresponding to oxygen isotope stages 2, 6, 12, 16 and 22 and the Weichselian, Saalian and Elsterian ice sheet advances). The most detailed system of glacial and interglacial episodes has been developed for Northern Europe, the British Isles, North America and the Alps. Most terrestrial evidence has, however, been destroyed by subsequent glaciations, and the terrestrial geomorphological and stratigraphic record of former glaciations is therefore incomplete. The last ice age in northern Europe, the Weichselian, is considered to be equivalent to the Devensian in Britain, the Wurmian in the European Alps, and the Wisconsin in North America. The last interglacial, the Eemian, Ipsxvichian, Riss-Wiirmian and Sangamon may all correlate with one another. In Europe, a sequence of stadials and interstadials has been recognized from areas (periodically) beyond the limit of the Weichselian glaciations. The terrestrial record of glacials and interglacials prior to the last interglacial has been more difficult to resolve. An inter-regional attempt at correlation is shown in Box 5.1. Recent work in the European Alps, northern Europe, North America and Britain suggests that several of the established stages contain several separate warm and cold episodes. In central Europe and China, loess deposits and intercalated soil horizons correlate closely with glacial fluctuations. Long lacustrine sequences with associated sediments together with animal and plant remains have the potential to be correlated directly with deep sea records (e.g. Kukla, 1977, 1989). Evidence of changes in the nature and distribution of ocean water masses has been obtained from planktonic and benthic foraminifera, and from microfloral remains in deep ocean cores. Together with lithostratigraphic variations (for example ice-rafted debris), these data sources provide records of oceanographic changes (e.g. Broecker et al., 1985). 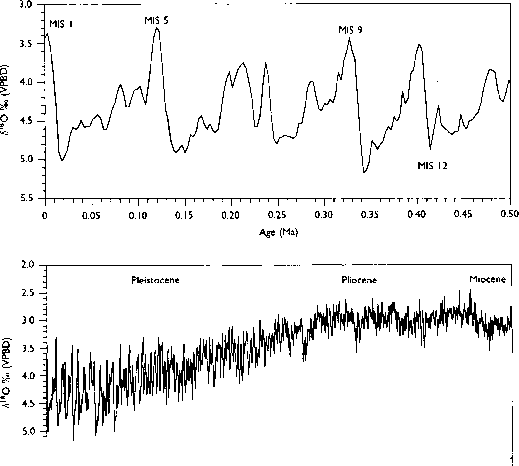 The global marine oxygen isotope record for the last 2.5 million years (Fig. 5.2) shows numerous oscillations mainly reflecting global ice volume changes. Before the late Pleistocene, glacial fluctuations had a dominant periodicity of about 40,000 years. Distinct cycles of 100,000 years duration are only present for the last 700,000 years. Interglacials as warm as the present (Holocene) occurred for only about 10 per cent of the Quaternary. Global Conveyor (Broecker and Denton, 1990) (Fig. 5.4). In the North Atlantic, the climatic impact of the NADW formation is significant. During winter, ventilation of the ocean by sinking of the surface water releases about 8 calories m~3 of water. The annual heat released to the atmosphere from this process is equivalent to about 25 per cent of the solar heating at the sea surface north of 35°N (Broecker and Denton, 1990). A switch-on/off mechanism for the North Atlantic conveyor has been postulated to explain rapid changes in ocean circulation in the North Atlantic during the last glacial/interglacial cycle (e.g. Broecker et al., 1990). Changes in the production and circulation of deep-water can be reconstructed from changes in cadmium and carbon isotopes in benthic foraminifera, since they reflect changes in nutrient budgets in connection with deep-water changes (e.g. Boyle, 1988). Svalbard occurred simultaneously (Fig. 5.5). Subsequent to 65,000 yr bp, however, the chronology and dynamics of the two ice sheets were different. The Svalbard-Barents Sea ice sheet experienced significant Middle and Late Weichselian ice advances, whereas the east Greenland ice sheet was characterized by a 55,000 yr period with a stable ice margin in the fjords or inner shelf areas (Elverhoi et al., 1998). The different behaviour of the two ice sheets was probably caused by the palaeocea-nographic circulation pattern in the polar North Atlantic. The Svalbard-Barents Sea ice sheet was under the influence of the relatively warm North Atlantic Current, whereas the east Greenland ice sheet was affected by the cold East Greenland Current. The east Greenland ice sheet seems to have developed during the Middle/Late Miocene, while the Svalbard-Barents Sea ice sheet developed during the Late Pliocene. The margin of the Svalbard-Barents Sea was characterized by major prograding fans formed by a series of debris flows, interpreted as products of rapid sediment delivery from fast-flowing ice streams which reached the shelf break during full glacial conditions. Off east Greenland, such submarine fans are not found north of Scoresby Sound. The east Greenland ice sheet rarely reached the shelf break, the sedimentation rates were relatively low, and the sediment transport was localized to several major deep-sea submarine channel systems (Elverh0i et ah, 1998). 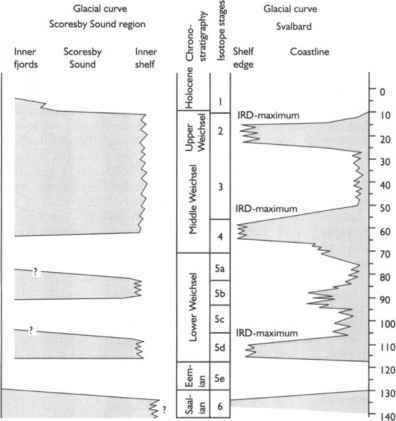 The glaciation history of Svalbard (78°N) and the NW Barents Sea during the last 130,000 yr, as reconstructed by Mangerud and Svendsen (1992) (see major review by Mangerud et al., 1998) from coastal cliff sections at the head of Isfjorden, shows four separate tills intercalated by marine sediments. The lowest marine formation contains Mytilus edulis,- reflecting higher temperatures than at present, and correlates with the Eemian interglacial (deep sea oxygen isotope stage 5e). The three tills above reflect major glaciations around 110,000 yr bp, 75,000-50,000 yr bp, and 25,000-10,000 yr bp. The ice-free periods occurred between 110,000-75,000 yr bp (the Phantomodden interstadial) and between 50,000 and 25,000 yr bp (the Kapp Ekholm interstadial). Marine faunal assemblages indicate seasonally ice-free conditions. The reconstructed glacial history during the last interglacial/glacial cycle led Mangerud and Svendsen (1992) to postulate that the Quaternary glaciations on Svalbard have been driven by the 41,000 yr tilt period, in contrast to the Scandinavian glaciations primarily driven by the 21,000 yr precession cycle. Linnevatnet indicate rapid deglaciation without any Late-glacial readvances after 12,500 yr bp (Mangerud and Svendsen, 1990). During the Younger Dryas, glaciers in the Linnevatnet catchment were even smaller than during the Little Ice Age, in contrast to the situation in NW Europe (Svendsen and Mangerud, 1992). From Edgeoya and Barentscya, east of Svalbard, four relative sea-level curves have been constructed (Bondevik et al., 1995). Subsequent to the formation of the marine limit at about 11,500 cal yr bp (ca. 10,00014C yr bp), the rate of land uplift was of the order of approximately 40mmyr-1. A minimum rate of uplift at 8000 cal yr bp was explained by decreased isostatic uplift in combination with eustatic sea-level rise. A steady emergence has taken place over the last 7000 radiocarbon yr bp. Bondevik et al. (1995) suggested that the regional Holocene uplift pattern reflects a larger glacio-isostatic depression in the southern Barents Sea during the last glaciation. For the past two decades, the glacier extent during the last glacial maximum over Queen Elizabeth Island (see England, 1998, and references therein) and in the NW Territories of Canada (e.g. Dyke et al., 1982) has been debated. The maximum model indicates a regional Innuitan ice sheet which coalesced with the Greenland ice sheet to the east and with the Laurentide ice sheet to the south. An alternative model suggests a non-contiguous array of alpine ice caps, termed the Franklin Ice Complex. Evidence presented from the eastern side of the Eureka Sound and elsewhere in the region (e.g. England, 1998) strongly supports the existence of an Innuitan ice sheet with glaciers covering the Nares Strait during the last glacial maximum. On Ellesmere Island, abundant ice-marginal features lie in a 500 km long zone with a distal margin 10-60 km beyond the present ice caps (Hodgson, 1985). At the head of the fjords, this drift belt was deposited between 9000 and 7000 yr bp. Subsequently the glaciers retreated, followed by a late Holocene glacier readvance (England, 1986). Despite the fact that the ELA was at about 500 m during the last glaciation, the glacier extent was rather limited (normally 5-40 km beyond present ice margins). The area must therefore have been characterized by extreme continentality (cold summers and less precipitation than at present). Recent dating evidence obtained from cosmogenic isotopes presented by Zreda et al. (1999) also suggests that the Nares Strait was filled with ice during the last glaciation, blocking the connection between the Arctic and Atlantic oceans, thereby supporting the model of extensive and long-lasting terrestrial glaciers in this region. suggests that the moraine is of the same age. This has been attributed to permafrost and buried glacier ice having survived much longer in the east than in the west (Astakhov et al, 1999). Reconstruction of the surface profile of the ice sheet reaching the Markhida Line suggests a very low gradient surface profile over a thick sedimentary substrate, while the surface profile was steeper near the Urals (Tveranger et al, 1999). Yakovlev (1956) proposed a restricted glacial maximum, with its southern limit following the Markhida moraine. Glacial elements indicate that this moraine system was deposited by the Kara ice sheet, and in the west, by the Barents ice sheet. The moraine is stratigraphically above Mikulino (Eemian) marine sediments (Mangerud et al, 1999). Beyond the moraines are Eemian marine sediments and three archaeological sites (not overrun by glaciers) with radiocarbon dates in the range of 37,00016,000 yr bp. Grosswald's Late Valdaian maximum ice limit is 400-700 km further to the south. Based on a series of radiocarbon and OSL dates of >45,000 yr bp proximal to the Markhida line, Mangerud et al. (1999) concluded that the Markhida moraine is of Middle/ Early Valdaian age. Terrestrial and marine evidence led Svendsen et al (1999) to suggest that the Late Valdaian/Weichselian ice margin of the Kara Sea ice sheet did not reach the present coast of northern Russia (Fig. 5.6), indicating that the Late Valdaian/ Weichselian glacial maximum was less than half of the maximum model which has been used as a boundary condition in global circulation models (GCMs). (Larsen et al, 1999b). Earlier syntheses of the development of the Scandinavian, Barents Sea and Kara ice sheets have generally postulated that they fluctuated in phase (e.g. Denton and Hughes, 1981). According to the model presented by Svendsen et al (1999), this concept must be changed. During the Early-Middle Valdaian/Weichselian when the Kara Sea ice sheet in the east reached its maximum extent, the Scandinavian ice sheet in the west was less extensive than at its Late Valdaian/Weichselian maximum stage. In the Late Valdaian/Weichse-lian, in contrast, when the Scandinavian ice sheet culminated, the Kara Sea ice sheet was small or absent. The role of the Barents Sea ice sheet is, however, still unresolved. At its western margin over Svalbard, two (Middle and Late) Valdaian/Weichselian maxima occurred (Land-vik et al, 1998; Mangerud et al, 1998). 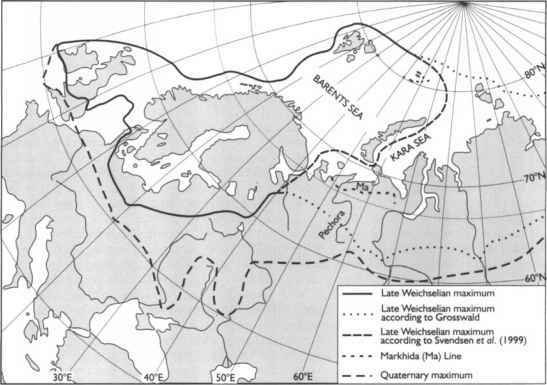 According to Grosswald, the melting of the ice sheet was dominated by a bipartition of the meltwater along the SW margin, with an initial phase of drainage towards the south to the Caspian Sea and the Black Sea, and later towards the west to Poland and Germany. In the final deglacial phase, the meltwater drainage was northwards to the Barents Sea. Based on studies of raised Holocene shorelines in northern Novaya Zemlya, Forman et al (1999) suggested that the Barents Sea ice sheet either melted at approximately 13,000 yr bp or was very thin. The palaeoclimatic record from the bottom sediments of Lake Baikal, East Siberia, has revealed evidence for an abrupt and intense glaciation during the initial part of the last interglacial period (isotope substage 5d). The glaciation lasted about 12,000 years from 117 to 105 kyr bp, according to correlation with the SPECMAP isotope chronology (Karabanov et al, 1998). The authors suggested that this glaciation was caused by cooling due to an orbitally-driven decrease in solar insolation, coupled with western atmospheric transport of moisture from the open areas of the North Atlantic and Arctic seas. Kunlun Shan and in the Tian Shan. Radiocarbon dates of around 15,000 yr bp correspond to a glacier advance south of the Qaidam Basin. Except for glacier readvances at about 3000 yr bp and during the Little Ice Age, the timing of glacier advances during the last glaciation on the Tibetan Plateau are in fact unknown (Lehmkuhl, 1997). There has been considerable debate concerning the glacier extent on the Tibetan Plateau at the last glacial maximum (LGM) (e.g. Shi et al, 1992). Kuhle (1987, 1988, 1991, 1998) postulated an ice sheet with a thickness of 2.5 km and an areal extent of 2-2.4 million km2. This means that, according to his reconstruction, an ice cap covered almost the entire Tibetan Plateau. An opposite view has been proposed by Chinese investigators, who concluded that glaciers were restricted to the main mountain areas with outlet glaciers discharging on to the plateau (Zheng, 1989). The areal extents of LGM and older glaciations discussed by Chinese investigators (for details, see Lehmkuhl, 1997; Lehmkuhl et al, 1998) differ from each other, but they all show only restricted mountain and plateau glaciation. In the eastern and central parts of the Tibetan Plateau, the LGM glaciation seems to have been restricted to isolated mountain massifs (e.g. Lehmkuhl, 1994), in agreement with the investigations by the Chinese researchers. At the northern margin of the Tibetan Plateau, however, the LGM glaciers were probably more extensive than proposed by the Chinese researchers (e.g. Hovermann and Lehmkuhl, 1993). Minimal and maximal models of Late Pleistocene glaciation on the Tibetan Plateau were evaluated by Kaufmann and Lambeck (1997) using present uplift rates, free-air gravity anomalies and eustatic sea-level rise. Their results are more in support of the large ice sheet proposed by Kuhle et al (1989) than the more restricted glaciation proposed by Gupta et al (1992). In the NW Himalayas and Karakoram Mountains of Pakistan and in NW India, three glacial events, progressively less extensive with time, have been mapped in most regions (Derbyshire and Owen, 1997; Owen et al, 1998). The ages of these glacial stages are, however, poorly known due to lack of the dating material necessary to establish an absolute chronological framework. In the Hunza Karakoram, glacier fluctuations at the end of the Pleistocene seem to have been characterized by several halts or readvances. In the Mongolian mountains, three areas bear evidence of Quaternary glaciations; Khen-tey, Khangay and Mongol Altai (Lehmkuhl, 1998). The glacial landforms there consist of mainly cirques, U-shaped valleys and hanging valleys. Based on weathering of sediments and morphostratigraphy, two major Pleistocene glaciations have been distinguished. The evidence of late Pleistocene glaciation in the southern ranges of the former Soviet Union is fragmentary and indirect (Bondarev et al, 1997). Up to the early Holocene, no moraines have been dated securely. A valley-type model (in contrast to an ice sheet model) of Pleistocene glaciation has been proposed. Up to five glacier advances have been tentatively reconstructed for the Late Pleistocene. Most areas were deglaciated by 10,000 yr bp, after which only small valley glaciers readvanced. At its maximum, the Eurasian ice sheet extended eastwards to the Ural Mountains, southeast beyond Kiev, southwards into central Germany and westwards to the British Isles. The subdivision into several ice ages is based on morphostratigraphic evidence, with progressively younger terminal moraine systems northwards. The different stages were named (from the oldest) Elster, Saale and Weichsel. The Saale glaciation was later subdivided into the Drenthe and Warthe moraine stages. All stages are considered to have been deposited during the last 900,000 years (e.g. Sibrava, 1986). Deposits from the Elster stage represent the earliest definite evidence of major glaciation in northwestern Germany and Europe. These deposits occur in connection with a series of deep, buried channels formed by subglacial meltwater. In contrast with the low- or no-relief deposits from the Elster glaciation, deposits from the Saalian and especially from the Weichselian glaciation exhibit distinct morphological features. The interglacial stages are represented by deposits of marine transgressions in the lower areas, and by terrestrial peat with pollen reflecting the vegetation during the different interglacials. The glacial stages in Britain equivalent to those on mainland Europe are considered to be the Anglian, Wolstonian and Devensian (West et al, 1988). In the British Isles, several glaciation centres existed during the Quaternary, and combined with frequent phases of coalescing with the Fennoscandian ice sheet, the moraine sequence is less evident there than in mainland Europe. from the Netherlands indicate that the major glaciations in Scandinavia and Svalbard started around 2.8 million yr bp. During the last 2.6 million years, warm interglacials like the Holocene did not last for more than 6-8 per cent of the time, whereas glacial maxima, like the 20,00018,000 yr bp Late Weichselian maximum, occupied less than 5 per cent of the time. The large-amplitude climate and ice-sheet fluctuations have occurred mainly during the last 900,000 years (Mangerud et al, 1996). During the Saalian glaciation the western margin of the Scandinavian ice sheet advanced on to the shelf, probably reaching the edge of the continental shelf. At the Saalian/Eemian transition, the ice sheet retreated rapidly and decayed perhaps within 2000 years or less. The Eemian, as initially defined in the Netherlands and correlated all over northern Europe, correlates with oxygen isotope stage 5e (Mangerud, 1989). During the Early Weichselian (oxygen isotope substages 5d-5a), two glacier advances occurred. The first (during substage 5d) did not reach the coast, whereas the second (5b) advanced to the coastline and released icebergs in some areas. During the Early Weichselian, two interstadials occurred in northwestern Europe, the Brarup/ St. Germain I and Odderade/St. Germain II (in Scandinavia represented by the Jamtland/ Perapohjola and Tarendo interstadials, respectively), which have been correlated with oxygen isotope stages 5c and 5a, respectively (Andersen and Mangerud, 1989; Mangerud, 1991). 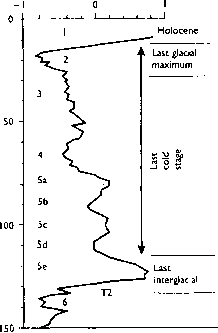 In general, oxygen isotope stage 5 in western Scandinavia was characterized by low IRD deposition and short glaciation phases (Baumann et al, 1995). In the Middle Weichselian, glaciers may have begun to advance during the early part of oxygen isotope stage 4 (ca. 70,000 yr bp). According to the IRD signal, however, the ice sheet did not reach its maximum position before ca. 63,000 yr bp. This glaciation phase was terminated by a deglaciation phase at approximately 54,000 yr bp. A glaciation dated to 47,000-43,000 yr bp on the terrestrial record is also found in the IRD record. Some thermoluminescence (TL) and U-series dates indicate that central southern Norway was deglaciated at 40,000-30,000 yr bp. A significant deglaciation phase is recorded both in the marine and terrestrial record between 38,500 and 32,500 yr bp (the Denekamp/Alesund interstadial) (Andersen and Mangerud, 1989). During the Late Weichselian, several ice-sheet oscillations occurred; the highest mountains in Scandinavia most probably stood above the ice sheet as nunataks (Nesje et al, 1988; Nesje and Dahl, 1992). The earliest Late-glacial warming in Europe occurred around 15,000 yr bp (Artemesia expansion). In some areas there is evidence of warming from around 13,500 yr bp; however, the most significant warming is recorded in pollen and Coleoptera assemblages from about 13,000 yr bp (Lowe and Walker, 1997). The thermal maximum of the Late-glacial interstadial complex occurred at 13,000-12,500 yr bp in Britain, The Netherlands, southwest Europe and Switzerland, between 12,500 and 12,000 yr bp in southern Scandinavia and Germany, and between 11,500 and 11,000 yr bp in SW and northern Norway (Fig. 5.8). Marked climatic gradients during this period most probably reflect the cooling effects of the retreating Scandinavian ice sheet and changing thermohaline circulation in the North Atlantic. In the Late-glacial sequence in northern Europe, a series of distinct climatic oscillations occurred, mainly recorded in pollen sequences. Boiling was a mild interstadial 13,00012,000 yr bp, followed by the cool and short Older Dryas stadial 12,000-11,800 yr bp. Allerad was a mild interstadial between 11,800 and 11,000 yr bp, followed by the significant Younger Dryas cooling and glacier expansion between about 11,000 and 10,000 yr bp (Mangerud et al, 1974). This cooling caused readvances of the Scandinavian ice sheet and expansion/ reformation of cirque glaciers beyond the continental ice sheet, especially along the western margin. In Scotland, a 2000 km2 ice field developed (e.g. Sissons, 1979b; Thorp, 1986; Ballantyne, 1989), whereas minor valley and cirque glaciers formed in the upland areas in Scotland, England, Wales and Ireland (Gray and Coxon, 1991). Warming Newfoundland? Warming New England? from Estonia and with sections located near or beyond the margins of the last glaciation. Organic sediments previously attributed to Early and Middle Weichselian interstadial periods in Finland were argued by them to be redeposited and mixed older material from the last interglacial (the Eemian). They suggested that the Eemian climatic optimum was followed by a continuously cooling climate and a marine regression. Their reinterpretation suggests that the ice sheet grew over Finland during the first Early Weichselian stadial. The preservation of the interglacial beds and the lack of younger non-glacial sediments, they argued, support the interpretation that the area remained ice-covered until the final deglaciation. During the last glacial-interglacial transition, the movements of the North Atlantic Polar Front have been described as hinging around locations in the western North Atlantic. Iceland, situated in the middle of the North Atlantic Ocean, has glaciers sensitive to changes in the oceanic and atmospheric front systems (Ingolfsson et al., 1997). The Late-glacial records from Iceland indicate that relatively warm Atlantic water reached Iceland during the Bolling-Allerad interstadial complex, with a short cooling period corresponding to the Older Dryas. Karpuz et al. (1993) suggested that the marine polar front was located close to Iceland during Bolling-Allerod, and Sarnthein et al. 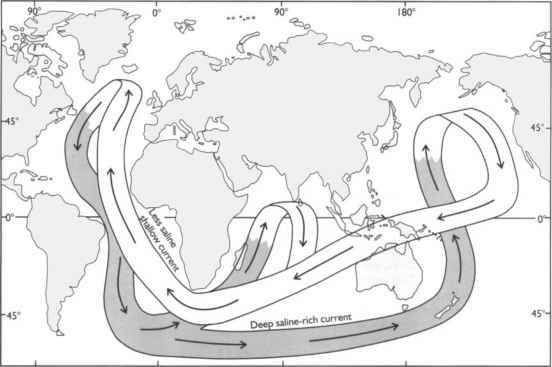 (1995) concluded that sea-surface circulation was mainly in a Holocene interglacial mode after 12,800 yr bp. Like elsewhere in NW Europe, an abrupt cooling marks the beginning of the Younger Dryas. Terrestrial data from Iceland demonstrate a transition from mild climatic conditions by the end of the Allerod, to polar conditions and significant glacier expansion. Pollen influx dropped significantly and the content of organic carbon in lake sediments from northern Iceland demonstrates rapid climatic change. The sequence of deglaciation and terrestrial biostratigraphical records indicate that the Preboreal was a period of ameliorating climate (Rundgren, 1995), and by ca. 8000 yr bp, glaciers were of similar size as at present (Kaldal and Vikingsson, 1991). Ash Zone 1 in Iceland consists of at least five different tephra populations deposited over a period of ca. 1500 radiocarbon years, as recognized in lake sediments from Skagi, northern Iceland (Björck et al, 1992), of which the Vedde and the Saksunarvatn ash layers are the most widely recognized. At their maximum, Alpine glaciers covered about 150,000 km2. The Alpine glaciers flowed as a network among mountain peaks and ice divides, with coalescing valley and piedmont glaciers. Based on work in the northward-draining valleys of the German Alpine foreland, south of Munich, Penck and Brückner (1909) presented a scheme of glacials (Würm, Riss, Mindel, Günz) and interglacials (Würm/ Riss, Riss/Mindel, Mindel/Günz) (Box 5.1). Subsequently, the four-part sequence was extended by the discovery of two older glaciations, the Donau and Biber. The four main glacial stages are represented by a series of terraced glacioflu-vial outwash plains ('schötter'); each younger and, in general, lower plain was related to terminal moraines further upvalley. During the interglacials, these were, according to Penck and Brückner (1909), eroded to form terraces. Problems with this classic Alpine sequence have been outlined (e.g. Sibrava, 1986). The sequence of terraces is more complicated than originally proposed, and contains both interglacial and postglacial material. In addition, the erosion is rather glacial than interglacial, and the deposits may represent only a few millennia of glaciation (Kukla, 1977). The classical nomenclature therefore only has mor-phostratigraphic significance in the study area of Penck and Brückner, and must be abandoned for external correlations (Sibrava, 1986). The glacial history of the eastern European Alps during the LGM has been reconstructed by mapping, palynology and radiocarbon dating. During the glacier build-up toward the LGM, topographical constraints in the form of deep valleys led to glaciers occupying tributary valleys and troughs until about 24,000 yr bp (van Husen, 1997). Subsequently, rapid glacier expansion in the main valleys led to ice streams and piedmont glaciers in the Alpine foreland. Radiocarbon dates obtained from organic material in the outwash ('Niederterrasse') show that the build-up ended around 21,000 yr bp. According to the outwash deposits, the LGM lasted for about 3000-4000 years. The deglaciation from the LGM was apparently very rapid. The glacier retreat was interrupted by minor oscillations at around 16,000 yr bp (Oldest Dryas), 14,000 yr bp (Gschnitz Phase), during the Older Dryas at ca. 12,000 yr bp (Daun Phase), and finally during the Younger Dryas between 11,000 and 10,000 yr bp (Egesen Phase). Glacial evidence in the Gran Sasso Massif of the central Apennines in Italy has led to the reconstruction and dating of the last glacial maximum advance and subsequent readvance phases (Giraudi and Frezzotti, 1997). During the Campo Imperatore Stade (22,600 yr bp) glaciers reached their maximum extent. During this phase, mean annual temperatures were of the order of 7-8°C lower than at present, and the amount of snowfall was similar to present. The glaciers started to retreat approximately 21,000 yr bp, forming three recessional moraines between 21,000 and 16,000 yr bp. Glacier retreat subsequent to 15,000 yr bp left behind another four moraines. There has been a growing recognition that the Egesen moraines in the Alps were deposited during the Younger Dryas (e.g. Kerschner et al, 1998). Surface exposure dates of Egesen moraines in Julier Pass, Switzerland, showed that the moraines were deposited during the early part of the Younger Dryas chronozone. In some valleys, numerous Egesen moraines are present, indicating oscillating glaciers. The moraine complex has been divided into three or, in places, four distinct groups. Snowlines, treelines and rock glaciers have been used to calculate temperature depressions and precipitation changes for the Younger Dryas using glacial-meteorological and statistical models. From these calculations, summer temperatures may have been about 3°C lower than at present, while annual temperatures were at least 4-6°C lower in the central Alps. Precipitation during the Younger Dryas was probably about the same as at present in the northern and western parts of the Alps, and decreased significantly towards the interior and the south. At the end of the Younger Dryas, precipitation decreased and in the Central Alps of Austria and eastern Switzerland, the climate was almost semi-arid (Kerschner et al, 1998). The Laurentide ice sheet extended from the Arctic Ocean in the Canadian Arctic archipelago to the mid-western states in the south, and from the Canadian Rocky Mountains in the west. The most extensive record of fluctuations along its southern margin comes from the north central United States. Named after the states where they are best characterized, the Nebraskan, Kansan, Illinoian and Wisconsin glaciations represent the glacial sequence (Box 5.1), the Kansan considered to be the most extensive glaciation. The earliest three glaciations are based on till sheets, while the Wisconsin was based on terminal moraines. The interglacials were based on palaeosols developed in tills. Based on new evidence provided by means of new methods and extensive fieldwork, the original stratigraphie nomenclature has been challenged (e.g. Hallberg, 1986). During periods of maximum Quaternary glaciation, including the Wisconsin glaciation, the continental ice sheet was more or less continuous over the North American continent. The ice sheet consisted of two main parts: the Cordillera ice sheet, centred in the Coastal range and Rocky Mountains in the west, and the Laurentide ice sheet in the east. The former was most extensive in the British Colombian mountains. The southern limit for continuous ice was at the Columbia River south of the Canada/USA border. The Laurentide ice sheet was, together with the Eurasian ice sheet, responsible for most of the glacio-eustatic lowering of sea-level of ca. 120 m during the LGM. Inferred from the pattern of postglacial uplift, the ice was thickest over Hudson Bay. The different parts of the Laurentide ice sheet reached their maximum extent between 22,000 and 17,000 yr bp. The Cordillera ice sheet, however, reached its maximum extent approximately 15,000-14,000 yr bp. During its maximum extent, the Laurentide ice sheet was more than twice as big as the north European ice sheet. To the north, the ice sheet may have coalesced with ice over the Queen Elizabeth Islands. Morphological evidence suggests that the Laurentide ice sheet had two ice centres, one over Labrador and one over Keewatin. In the Canadian and northern American Rockies, glacier fluctuations have been reconstructed using stratigraphy of glacial deposits, geomorphology, and lake and peat deposits. The history of glacier recession of the Late Wisconsin valley glaciers in the Canadian and northern American Rockies is not well documented (Osborn and Gerloff, 1997). Evidence presented so far suggests that glaciers retreated to within tens of kilometres of the present ice margins before ca. 12,000 yr bp. Moraines a few kilometres beyond Little Ice Age moraines indicate one or several read-vances or stillstands. The Piper Lake moraine suggests a readvance before 11,200 yr bp. An age of ca. 11,000 yr bp from sediments above Late Wisconsin till at Crowfoot Lake indicates that glaciers had retreated to modern limits at that time. In the Mission Mountains, glaciers had retreated to within less than 1km of the cirque headwalls by 11,200 yr bp. Data from Crowfoot Lake indicate that a minor readvance of Crowfoot Glacier occurred between ca. 11,300 and 10,000 yr bp (Osborn and Gerloff, 1997). Subsequent to the Crowfoot Advance, most glaciers in the Rockies retreated, as demonstrated by wood radiocarbon-dated at 8200 yr bp washed out from the base of the Athabasca Glacier. Osborn (1985) compared modern and Crowfoot ELAs using the median altitude approach. ELA depression during the Crowfoot advance ranged from about 5 m for small basin-filled glaciers, to 195 m for the large and steep Jackson Glacier, with a mean of 40 m ELA difference. Based on organic content and magnetic susceptibility of continuous lake-sediment records of glaciations in Sierra Nevada, California, at least 20 stadial-interstadial oscillations between 52,600 and 14,000 yr bp are indicated (Benson et al, 1998). The record shows that a glaciation (Tioga) started at approximately 24,500 yr bp and terminated at around 13,600 yr bp. Alpine glacier oscillations in Sierra Nevada have occurred at a frequency of approximately every 1900 years during most of the last ~50,000 years. The Late-glacial Recess Peak advance in the Sierra Nevada was the first major glacier advance after retreat from the local Late Wisconsin (Tioga advance) glaciers. Dated lake cores suggest that the Sierra was deglaciated by 15,00014,000 yr bp (Clark and Gillespie, 1997). Cirque moraines in Sierra Nevada show that the last significant pre-Little Ice Age advance (the Recess Peak of late Pleistocene age) resulted from ELA lowering of about twice that of the Little Ice Age (Matthes advance). Tephrochronology and radiocarbon dates from lacustrine sediments provide time constraints on the two advances. The absence of a young tephra on Matthes moraines in the central Sierra shows that they formed subsequent to 700yrBP (ca. 650 cal years). The termination of the Recess Peak advance was established at 11,200 yr bp by extensive AMS radiocarbon dating on gyttja, peat, and macrofossils from cores. The evidence presented suggests that if there was an advance related to the Younger Dry as cooling, it was less extensive than the Matthes advance. In addition, the Matthes advance was the most extensive and most probably the only Neoglacial advance in the Sierra Nevada (Clark and Gillespie, 1997). In the eastern Colombian Andes, major glacial advances preceded the LGM at 18,00020,000 yr bp (Helmens et al, 1997). Two glacial advances probably date between 43,000 and 38,000 yr bp and between 36,000 and 31,000 yr bp (isotope stage 3). These events are mapped from glacial sediments and moraine complexes. Three glacial advances are mapped between 23,500 and 19,500 yr bp, 18,000 and 15,500 yr bp, and the last one between 13,500 and 12,500 yr bp. The glacial landforms related to the 18,000-15,500 yr bp advance are the most distinct, forming arcuate, multiple ridges up to tens of metres high (Helmens et al, 1997). Studies of late Quaternary moraines and lacustrine sediments around the southern Altiplano of Bolivia show a more-or-less synchronous development during the last glacial cycle. Radiocarbon dating of peat associated with glaciofluvial and glacial deposits indicate that the largest glacier advance at the end of the last glacial cycle culminated subsequent to 13,300 yr bp, and that a smaller glacier read-vance possibly occurred between 12,000 and 10,000 yr bp. As the highest lake-level stand (Tauca phase) occurred at ca. 13,800 yr bp, it has been suggested that increased humidity and low temperatures during the time interval 14,000-13,000 yr bp were the main forcing factors for glacier expansion at that time (Clapperton et al, 1997). At the South Patagonian Icefield in Chile, the LGM margin was marked by moraines approximately 50 km from the present glaciers. At the icefield there is also evidence of two Late-glacial advances, represented by marginal deposits, including terminal moraines, 18-20 and 10-16 km from the margin of modern southern outlet glaciers from the icefield (Marden, 1997). Pumice clasts from an eruption of the Reclus volcano at about 11,900 yr bp gives a close limiting age for the older Late Glacial readvance, while the younger readvance occurred between 11,900 and 9200 yrBP. A review of radiocarbon-dated glacier fluctuations in the northern and southern Andes indicated that seven to eight advances took place more or less synchronously during the interval from approximately 40,000 to 10,000 14CyrBP (Clapperton, 1998). The timings of these advances closely match the cold intervals identified in the records from the Greenland ice cores and North Atlantic deep-sea sediments, implying that there are mechanisms that can rapidly transmit a thermal signal through the atmosphere. In the southern Alps of New Zealand, the LGM glaciers reached their maximum extent between 22,300 and 18,000 yr bp (Fitzsimons, 1997). A glacier readvance, almost reaching the extent of the LGM glaciers and possibly with two maxima, took place between 16,000 and 14,000yrBP. Altogether, there is evidence for at least four advances between 18,000 and 8000 yrBP. Subsequent to 14,000 yr bp, the glaciers retreated, however, interrupted by minor glacier readvances at around 11,000, 10,250 and 8600 yr bp (Fitzsimons, 1997). Although there is evidence of Late Pleistocene glaciation in the North Island of New Zealand, the advances are poorly dated and there is no evidence of glacier activity subsequent to the LGM (Shepherd, 1987). The glaciation history of Antarctica between the end of the last interglacial (oxygen isotope stage 5e) and the last glacial maximum (LGM) (oxygen isotope stage 2) is not well known. It has been suggested that the West Antarctic ice sheet melted totally or partly during the last interglacial (Mercer, 1978; Denton and Hughes, 1981). It has also been speculated that high interglacial sea-levels may have caused rapid disintegration of the Ross and Weddell ice shelves, also influencing the dimensions of the ice caps since they were not buttressed by ice shelves. Some information, although controversial, is available about the extent of the ice sheet during the LGM. One opinion is that both the West and East Antarctic ice sheets extended to a position close to the edge of the continental shelf between 21,000 and 17,000yrbp (Heusser, 1989). Another view is that the West Antarctic ice sheet was not much larger during the LGM than at present (see Denton and Hughes, 1981, for further discussion). Denton and Hughes (1981) suggested that the total ice volume of both the West and East Antarctic ice sheets during the last glacial maximum was 37 million km3 (present volume 24 million km3), mostly as a result of expansion of the East Antarctic ice sheet. This volume increase caused a 25 m lowering of global sea-level. sheet fluctuated in phase with global sea-level changes, which again were influenced by the northern hemisphere Laurentide and Eurasian ice sheets (Hollin, 1962; Denton and Hughes, 1981; Labeyrie et al, 1986; Heusser, 1989). The development of the Antarctic ice sheet during the Late-glacial episode may, however, have been influenced by decreased precipitation or precipitation starvation due to sea-ice expansion (e.g. Mercer, 1983). Alpine glaciers on south Victoria Land retreated during the LGM, possibly due to this effect (Stuiver et al, 1981; Mercer, 1983). Denton et al. (1971) proposed a more complex history for the Dry Valleys in south Victoria Land. During worldwide glaciation periods, with grounded ice in the McMurdo Sound and Ross Sea, glaciers advanced into the Dry Valleys, while adjacent land-based glaciers retreated due to reduced precipitation.